This swede curry recipe gives the Thai dish known as massaman a root vegetable twist. 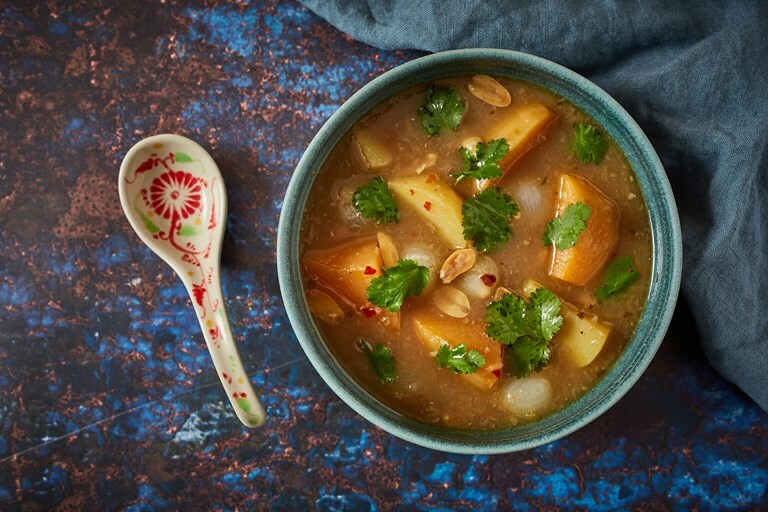 The intensely flavoured curry paste is loosened with coconut milk and stock, with a combination of swede, potatoes and button onions gently poached in the liquid until tender. Take a look at Anna's other swede recipes here. This is quite a racy recipe for me, veering away from my usual European comfort zone. But this curry has quite a soothing quality – hearty, rich and unctuous with a warmth of spice. You will definitely be forgiven for buying a pre-made paste but here is the full recipe in case you feel motivated to make the whole thing from the beginning, which I can recommend as the flavours are that much more present and vibrant. Inspiration for this recipe comes from Vatch’s Thai Street Food by Vatcharin Bhumichitr. Alternative suggestion: massaman curry is traditionally a meat curry and is delicious made with lamb neck. In this instance braise the lamb (cut into 2cm slices) for an hour until tender. For another vegetarian version, cauliflower is also very good in this curry. Add florets of it at the same time as the potato.